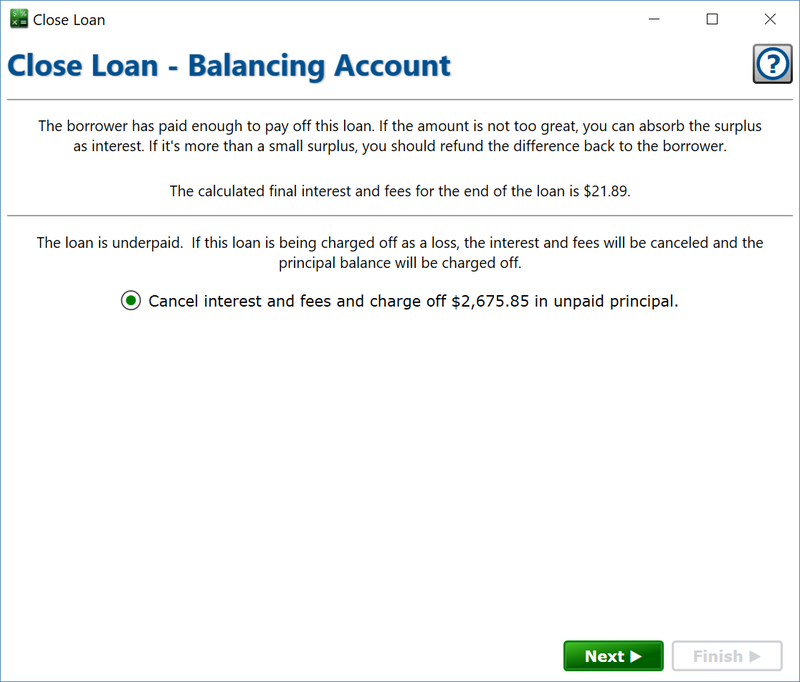 You get here from the previous step of the loan closing wizard, which will either be choosing the closing date, or closing the escrow account. Moneylender will take some steps to ensure all the funds on a loan are accounted for properly when the loan is closed. Before closing a loan, ensure that all payments after the last due date are marked as Payoff payments. This will ensure Moneylender doesn’t treat them as normal payments and potentially hold the funds until the upcoming due date. Payments that are entered through the payoff calculator are automatically marked as Payoff payments by default. The balances are already perfectly zero. The borrower has overpaid the loan. There is a remaining unpaid balance on the loan. Click Next to go to the Closing Overview step. No further work is needed to zero out the loan, it’s perfect as it is. You have received more money that was necessary to pay off the loan in full. This is quite common. It can happen when a payoff payment arrives before the date used when generating a payoff quote. The quote will include per-diem interest up to some date, and the payment is early, so some of that interest wasn’t earned and should be refunded. It can also happen if the escrow account has a balance that’s being applied to the loan (with the borrower’s express permission) and is more than the remaining balance on the loan. The surplus should be refunded to the borrower. If the borrower sends you more than the total to pay all the balances by the date of the final payment, you’ll end up with a credit balance on the loan. Refund the surplus to the borrower (often, this is required by the loan contract). A principal disbursal will be added to the account for the amount that should be refunded to the borrower. Increase the final interest to absorb the surplus. If the difference is very small, it’s probably ok to adjust the interest a little bit so the balance comes out to exactly zero. The borrower has underpaid the loan. In this case, your only recourse is to cancel any earned interest and fees due and charge-off the unpaid principal balance. When you are determining your overall profitability, treat the amounts charged-off as a business expense to offset the profit from interest and fees.